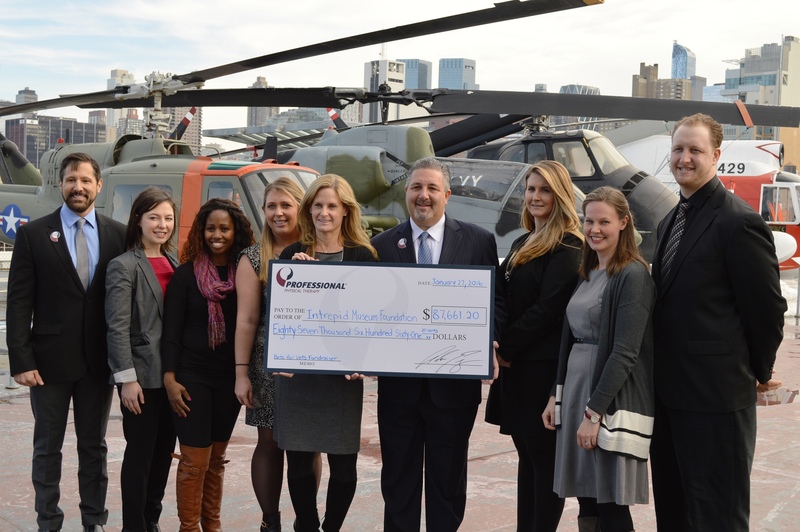 Professional Physical Therapy, a leading provider of physical therapy and rehabilitation clinics throughout the Tri-State area, presented the Intrepid Sea, Air & Space Museum with a check for $87,661.20 on January 27th. The donation will go towards the Intrepid Museum’s Veterans Access Initiative, which is new programming designed to support veterans, including those with traumatic brain injury and psychological health conditions and their families. "Giving back to our communities is a crucial component of the foundation of Professional Physical Therapy. We strive to incorporate philanthropic endeavors as often as possible throughout the company," said Adam Elberg, CEO and Founder of Professional Physical Therapy. "Collaborating with the Intrepid Museum was a natural fit due to its distinguished track record of providing specialized programming to support under served communities, including its efforts to address the imperative need for veteran support." Professional Physical Therapy successfully raised this money through a fundraising casino event hosted at the Intrepid Museum called, "Bets for Vets," which acknowledged the critical need for emotional and physical assistance for returning military personnel. This inaugural campaign was an instrumental part in the creation of the Intrepid Museum‘s Veterans Access Initiative - a cause that Professional Physical Therapy is passionate about. "We are incredibly grateful for the hard work and generosity of Professional Physical Therapy, whose donation will enable the Intrepid Museum to launch a Veterans Access Initiative that will provide a safe and social space for military service members and their families," said Barbara Johnson Stemler, Manager of Access Programs at the Intrepid Museum. "This crucial funding will make it possible to reach more veterans through three new programs - a Military Family Program series, Intrepid After Hours events and Vet Video Chats, all of which aim to break down real and perceived barriers to the Museum as well as the larger military community." Professional Orthopedic and Sports Physical Therapy ("Professional"), headquartered in Uniondale, New York, is an award-winning, leading provider of physical therapy and rehabilitation services in the New York metropolitan area, New Jersey and Connecticut. Founded in 1998, Professional now operates 62 outpatient physical therapy centers: 12 located within Equinox Fitness Centers, five located in Blink Fitness facilities, one located in a STACK Velocity Sports Performance Center, and 44 standalone. The company's outpatient physical therapy centers provide treatment to patients suffering from musculoskeletal impairments associated with orthopedic and sports injuries, and other medical conditions. Additionally, Professional operates a 20,000 square foot sports performance training facility in Garden City, New York.